More than ever, reforming the economies of Arab countries is the order of the day. And with good reason. In 2017 their average rate of unemployment was estimated at 10% as against a world average of 5.5%. And this figure fails to account for major disparities. The rate is 12.1% in Egypt, 14.9% in Jordan, 15.4% in Tunisia. The rate of unemployed youths is 26.1% and for women 18.9% in a region where the activity rate, i.e. the percentage of participation in the workforce of those who are of an age to work, is already the lowest in the world (48.6%). The rates of expatriation among college graduates are also among the highest in the world, while 30% of these were unemployed in Egypt, Tunisia and Jordan in 2011 and 2012 (1). In addition, Arab countries import over 50% of the grain they consume and are the world’s largest importers of foodstuffs (2). Because of this heavy dependence on international markets, the region is especially vulnerable to fluctuations in the prices of agricultural commodities. The global food crisis of 2007-2008 and the ensuing rise in the prices of basic cereals (rice, wheat) caused more inflation, increased trade deficits, worsened poverty and led to street protests in several countries (Yemen, Egypt, Morocco). This vulnerability was to be aggravated in the years to come by population growth, poor agricultural productivity and the increasing scarcity of water. Another revealing symptom: 11 countries in the region are carrying a public debt which was over 50% of their GDP in 2017 (3). Among them Jordan (96.6%), Egypt (101%), and Lebanon (149%). In some instances the debt accounts for 40% of budget expenditures. Between 2012 and 2016, no less than 5 Arab countries (Morocco, Tunisia, Egypt, Jordan, Iraq, Yemen) borrowed from the International Monetary Fund (IMF). In return their governments must file reports two or three times a year with the IMF experts detailing their compliance with their commitments : reducing their budget deficits, allowing their money to float against the dollar and the euro, cutting their social subsidies and doing away with civil service jobs. To explain these many “ dysfunctions” , the existing economic literature generally points to the predominance of windfall structures and the weakness of the productive fabrics. Indeed, the Arab world has the planet’s largest reserves of hydrocarbons, with 42% of its oil reserves and 29% of its natural gas reserves in 2016 (4). In addition to the revenues produced by the sale of these hydrocarbons, other windfall incomes are generated by transit fees on international trade, wages sent home by emigrant workers and foreign aid or credits, especially voluminous because of the region’s unique geostrategic location. A situation which favours among other things the establishment of authoritarian and irresponsible political regimes. These use the windfall incomes to keep their control over economies which have become ineffectual as a result of corruption, clientelism, nepotism and the abusive use of public funds. Now, since the eighties, the dominant framework for reforming these economies has been the “Washington consensus”: a set of approved measures meant to favour the advent of a market economy as canonized by the World Bank, the IMF and an increasing number of governments around the world. Trade liberalisation, privatisation of the economy and financial deregulation are considered remedies for the many ills that ail the Arab world. The implementation of these reforms was supposed to lead to the democratisation of governments and societies, the pacification of the region as well as the modernisation of its economies and their integration into the global economy. Today we still appear to have a rather long way to go. Whence the urgent need to deepen the discussion about the economic and societal challenges facing this region. In particular we need to take into account new perspectives and to multiply the number of forums devoted to this discussion. This is what this thematic dossier prepared by Orient XXI and its partners, who have together formed the Network of Independent Media on the Arab World aims to contribute to, by offering journalists in the Arab world an opportunity to shed light on the economic reforms in the region. What these seven articles have in common is that they are less concerned with what the nature of these reforms should be than what they already are, which in itself constitutes a subtle bias. By studying the different political, economic and institutional contexts in which these reforms have been implemented and the consequences they have had, these authors have accepted the challenge of appropriating the terms of a debate only too often confiscated by professional economists. Thus they offer a different perspective on the virtually universal application of neoliberal policies in the Arab world for at least the last two decades. Most of the time these new orientations have been introduced by governments in exchange for loans from international financing bodies or from other States. Which has provided an opportunity, as Malek Lakhal (Nawaat) tells us, taking the Tunisian example, for all those “friends” to interfere in the domestic politics of a country in ways that correspond to their vision of things and their vested interests but which seldom jibe with the concerns of the population. Thus the rulers of Tunisia conduct a kind of dependence management which takes the country even further away from the prospect of any real economic reform. In Lebanon, dependence management takes another form. 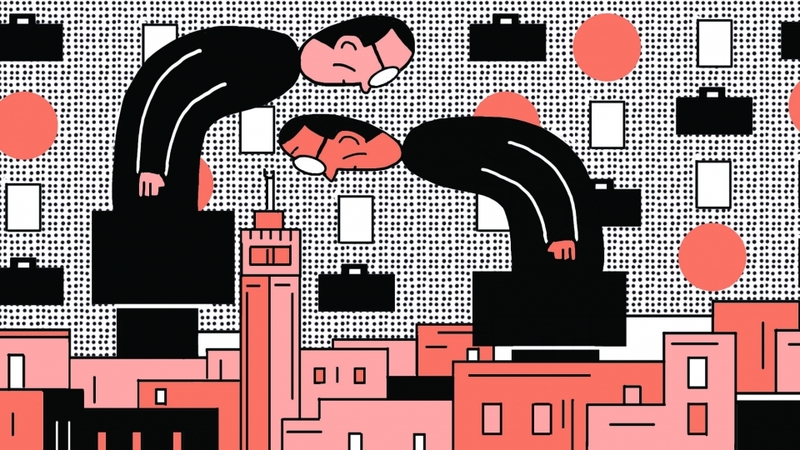 Indeed, Marie-Josée Daoud (Mashallah News) provides an account of an alarming situation in which local banks finance the over-indebtedness of the Lebanese government at interest rates which are high enough to attract deposits from foreign investors. Thus the debt provides wonderful windfall profits for these banks and handsomely remunerated international speculators. At the same time it represents an increasingly heavy burden on the public budget, to the detriment of badly needed productive and infrastructural investments, in a headlong, lemming-like rush, which may well end in general bankruptcy. As for Amar Ingrachen (Maghreb émergent) he discusses the debate over the issue of central bank independence in North African countries. In theory, this independence has been adopted in order to protect the national economies from political instability and the logic of “politicking.” However, they are also an opportunity to restrict the goals of monetary policy to the fight against inflation, in order to send a strong signal of financial stability to international lenders and investors. In this sense, central bank independence from the State provides a direct impediment to a country’s sovereignty and democratic process. Unless one imagines built-in mechanisms guaranteeing that the economic needs of the population be taken into account, which does not seem to be the order of the day. The repayment of the debt and the State’s capacity to refinance itself on the international scene is therefore at the heart of any policy of economic reform in the Arab world. Basing his reflection on the case of Jordan, Doa Ali (7iber) warns us against the mirage brought about by the official accounts of the government and the IMF. The Fund still insists on holding up Jordan as a model of successful economic reform, for having adopted multiple policies of liberalisation, privatisation and budgetary rigour since the end of the eighties. Yet these policies, put into practice ostensibly to reduce the budgetary deficit and repay the debt, have mostly been responsible for the gradual erosion of the social safety net and the increasing poverty of the population without any change in the Jordanian productive fabric nor in the country’s dependence on foreign financing. In Egypt too, the reforms put into practice under the aegis of the IMF result in a drop in that share of public expenditures which directly affects the living standard of the population as a whole without achieving the ostensible goals of reducing the debt or the balance of payments deficit. Neglecting health, education and even public transport, the government plunges into mega construction and infrastructure projects meant to create an environment favourable to foreign investment. Maye Kabil (Mada Masr) questions outright the legitimacy of the heavy burden which these reforms, imposed without any transparency or consultation, place upon the majority of Egyptians. While dismantling the public sector increases the vulnerability of the most deprived sections of society, it favours the emergence of a new class of ”clients” close to the political power structure who get rich by laying their hands on the keys of economic accumulation. Thus Yassin Swehat (Al-Jumhuriya) describes the rise of new oligarchies in Egypt and Syria where neo-liberal reforms have made possible the private re-appropriation of the most thriving sectors of the economy by the ruling elites, no longer obligated by any responsibility with regard to economic development or social progress. Majd Kayyal’s (Assafir Al-Arabi) text deals with the application of standards of “financial transparency” and “good governance” in a counter-insurgency logic in the occupied Palestinian territories. The Israeli authorities, but also those of the PA, endorse the rhetoric of international financial bodies with an eye to closing down the parallel funding circuits which fuel Palestinian resistance and allow a population left at the mercy of the Israeli occupation to hold on (prison canteens, support for martyrs’ families, etc.). The need to reform Arab economies is, of course, not at issue here, quite the contrary. The articles collected let us nonetheless glimpse a serious discrepancy between the rhetoric of reform and the reforms themselves. They should stimulate the debate around choices and practices which are primarily political and have very concrete consequences on the populations involved. In the Arab world as elsewhere, what is at stake is to denounce the claims by classical economists that their discipline is a hard science, claims intended to foreclose all debate and legitimize the dominant rhetoric. It is indeed time to worry about these practices which aim to shape the development of our economies while ignoring the majority of the people. 1-	Lili Mottaghi, “The Problem of Unemployment in the Middle East and North Africa Explained in Three Charts”, World Bank, 25 August 2014. 2-	“The Grain Chain : Food Security and Managing Wheat Imports in Arab Countries”,World Bank/FAO, 2012. 3-	“Arab Region 2017 in Review-”, UNDP, February 2018. Post-doctoral researcher in political economy on Palestine and the Middle East, University of Aix-Marseille, CNRS, Iremam/LEST, LabexMed.